Craig Lyndes is an IT specialist with 30 years of experience supporting technology in Vermont schools. He has crossed the country 10 times on his motorcycle, including venturing to Alaska. 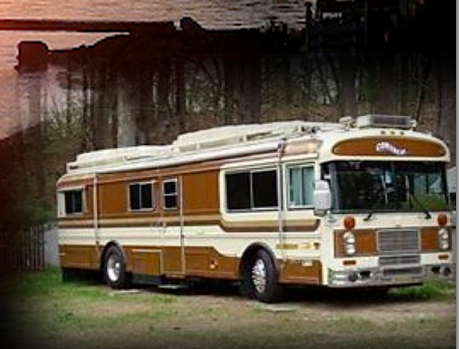 In 2004, he gave up his job as network administrator of Vermont's largest school district and traveled around the United States with a 1980 Allegro RV and Kawaski Nomad motorcycle. He chronicled his travels at http://users.gmavt.net/craigl/ He has been a long time admirer of the Bluebird WanderLodge and purchased his bus in 2009. The bus is a 1983 BlueBird WanderLodge. Although he would prefer to have his '98 Honda ST-11 motorcycle in tow, Craig compromised by agreeing to tow along a vehicle Lucie could drive also (a 2003 Saturn). He also has done an amazing job making sure it is equipped with wifi while traveling down the road, which he documented in our blog.